There is nothing which says “I love you” more than a stunning piece of jewelry, the ultimate symbol of everlasting love. Amidst all the sparkles, the ember of your love shines bright and beautiful, for the world to see and the heart to cherish. If your anniversary is right around the corner or maybe you just need an excuse to shower your partner in crime with all the things she deserves, jewelry is perhaps the one gift which never fails to tug at the heartstrings. Perfectly sentimental with emotions which translate to breathtaking beauty, it captures both the heart and eye. But when you are looking for jewelry, the kind which transcends time and everything in between, who can ever resist the gorgeous pull of Swarovski crystals? There is just something about a beautiful Swarovski that wins hearts. The tender elegance, an ethereal charm and of course, dazzling crystals which catch the light-Swarovski jewelry is indeed a romantic show of love but also an embodiment of trust, faith, and respect, the magic dust of the perfect relationship. For your better half, the one who’s been by your side through thick and thin, there could be no better tribute. And when your lady love dazzles the heavens beyond with her spectacular Swarovski pieces, gifted by you, your love for each other is bound to reach dizzying heights. Graced by the beauty of these jewels, anyone would be gleaming with happiness! 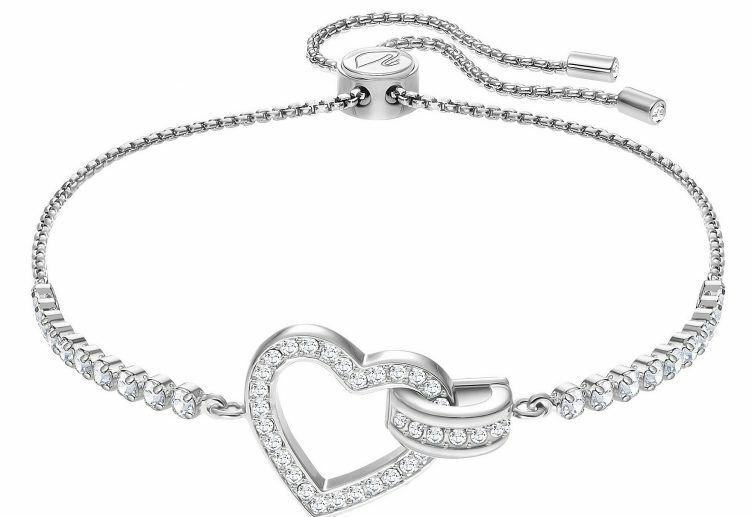 Swarovski is certainly not a stranger to capturing hearts. After all, that’s what they have been doing for the past 127 years. For more than a century, they’ve built a legacy, revolving around beautiful and timeless jewelry. And today, Swarovski, with its romantic crystals and stunning facets, is the crowning glory of every woman’s jewelry collection. It all started in a glass cutting factory in Austria. Daniel Swarovski worked under his father’s tutelage in their factory and the young man’s skilled dexterity and business acumen were already creating ripples. Until then, glass cutting was done by hand; not only was it strenuous but the glass crystals were not always of the desired standard. In comes Daniel with his invention, a glass the cutting machine, an innovative contraption which turned the jewelry industry on its head. With the patented machine in Swarovski’s name, their crystals transformed into a force of nature. Cuts, colors, coats- experimentation was at its peak and Swarovski delivered every time. With cutting-edge innovation in the realm of crystals, the world just had to take notice. Even Queen Victoria’s dresses were embellished with Swarovski crystals- what could be a greater endorsement for the soaring brand? Swarovski collaborated with luxury brands like Chanel and Christian Dior and together they created iconic crystal pieces which shall remain forged in history. From the logo of an edelweiss flower to that of a graceful swan, Swarovski has indeed come a long way. 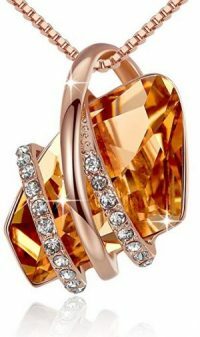 Swarovski designs are, of course, beautiful works of art but they also represent class and elegance, jewelry not just meant to be worn but an aspirational standard. Gifting someone Swarovski jewelry is a weighty gesture; it is definitely meant for the special one in your life. Although we are taking upon it ourselves to guide you along the crystal paved path, one thing’s for sure: Swarovski jewelry is always a charmer. And even when our list of Swarovski gifts for your partner showcases to you the most romantic pieces to have been crafted, you might just find yourself confounded by yet another Swarovski creation. There is no way you can lose with these spectacular crystals. That being said, check out some of our favorite Swarovski jewelry, the perfect gifts for your loved one. 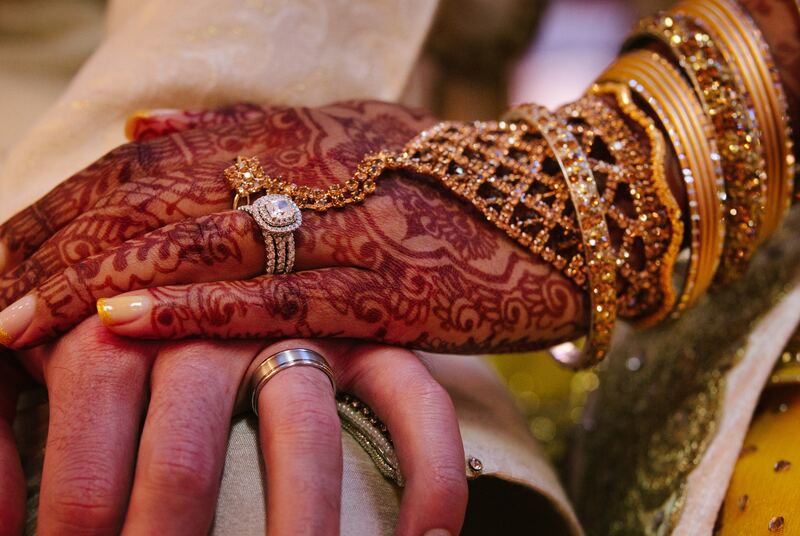 These gorgeous accessories tell a lilting story of love, devotion and a lifetime of togetherness. We promise each and every one of these will make hearts flutter. Who can ever forget the iconic Heart of the Ocean diamond from the movie, Titanic? The story of the star-crossed lovers, Jack and Rose, was itself a heartrending romance but the diamond, in its startling blue, became an emblem of an undying love. J.Nina presents their take on the stunning necklace, embellished in Swarovski crystals, with the Rose Heart Necklace. 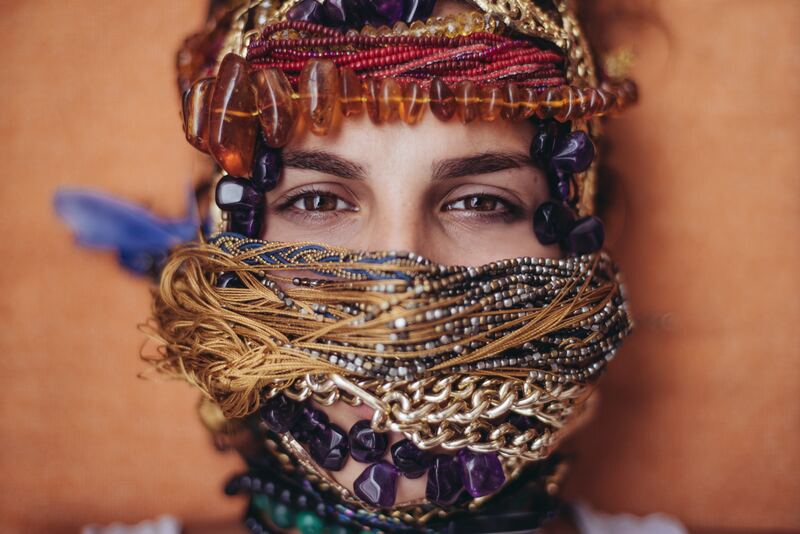 Anyone browsing online for jewelry made from Swarovski crystals will have heard of J.Nina. The online jewelry giant creates stunning pieces, fashionably modern with elegant crystals, styles which will stand the test of time. Their designs are inherently feminine-teddy bears encrusted with Swarovski for the young girl or chandelier earrings, sparkling with crystals, for the stylish woman. Romantic and stunning, the Rose Heart Necklace is right on the mark. With motifs such as the heart, rose and the ocean, the symbolic meaning of the necklace is heard, loud and clear. From the Heart of the Ocean collection by J.Nina, the Rose Heart necklace is a beautiful coat of Swarovski crystals. The pendant itself is a hefty piece, large and shimmering. A beautiful rose is carved at its top, its concentric petals studded with glorious Swarovskis. The rose drops down to form a big heart crystal, of a Bermuda blue color which pierces the eyes, tilted to its side. 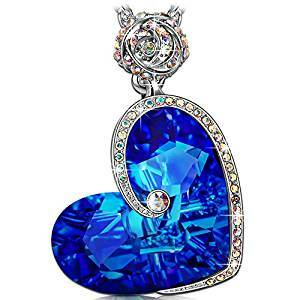 One half of the heart is delicately lined with little Swarovski crystals, encased in silver, popping against the blue of the heart. The Swarovski crystals in the pendant, except for the blue heart, are of the Aurore Boreale color, a prismatic rendition of the stunning Northern Lights. And yes, it is the very same style which Swarovski developed together with the man and the legend, Christian Dior. The necklace is made from a zinc alloy with no nickel or lead at all. So, if skin allergies are a worry, you can check that off the list with the Rose Heart Necklace. The chain is 17 inches long and can be extended to 2 more inches. The Rose Heart Necklace by J.Nina is simply perfection from the Aurore Boreale crystals to the hollowed detailing at the back of the pendant. And with 4.8 stars out of 5 on Amazon, the world is clearly enamored with this stunning accessory. If you were searching for that one gift that could capture the heart of the special one in your life, look to the ocean and you will find your answer. For the kind of fierce passion that could cut through glass, you don’t even need diamonds. A short and sweet declaration of love is enough to set hearts into speeding. And how do you do that when you’ve said it countless times already and showered her with everything she could ask for? Why, with Swarovski, of course. The Pure Brilliance Stud Earrings by Central Diamond Center, in the classic Swarovski style, will win her heart all over again. Central Diamond Center is an exclusive jewelry store which has been established in 1989. Their collection boasts largely of wedding bands, engagements rings, diamonds- it is a couple’s haven. You can even design your own jewelry for a more special piece as Central Diamond Center guides you along the way. When it comes to jewelry, specially made for people in love, nobody does a better job than this brand here. How good can stud earrings really be? Wait till you see this extraordinary pair. With a round cut Swarovski Zirconia crystal on both your ears, set on its frame with four prongs, its glaring beauty is impossible to miss. As we know, cubic zirconia or CZ stones are artificial diamonds but the zirconia stones designed by Swarovski are a class above any of the others. These are brilliant globules, fragmenting into thousands of shimmering shards under the light, emulating natural diamonds to an uncanny perfection. The Swarovski Zirconia is encased on top of a sterling silver basket while the posts of the earrings are made from 14k gold. 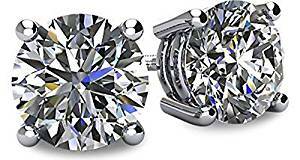 The Pure Brilliance Stud Earrings are hypoallergenic and the post is double notched for a secure fit that never falters. These earrings are available in a number of styles: rose gold, yellow gold or white gold. If you ask us, the Pure Brilliance Stud Earrings in white gold is an absolute vision to behold, romantic and elegant. You may also choose the weight of the Swarovski Zirconia; Central Diamond Network offers a wide range from 1 carat to 8 carats. Walking into a party with a beautiful gown and these stud earrings on the ears, the look calls to be awash with compliments. The dazzling brilliance of the stones and the understated elegance of the overall accessory speak to the heart, conjuring soft emotions with just a swift gaze. Just remember, when your better half unwraps this beautiful gift, a few happy tears may be shed. Swarovski crystals are always romantic. But with the right design, a pretty motif and sparkles which can’t be missed, a Swarovski accessory can make hearts skip many a beat. The Wish Stone Pendant Necklace by Leafael is just one such necklace, softly lit with crystalline drops with a hint of the cosmic, that you will cherish for the rest of your life. Can’t get enough of Swarovski? Check out Leafael to feed the craving. The online jewelry retailer works with authentic Swarovski crystals to create beautiful works of art, jewelry that does more than just adorn. Soft hues, teardrops and little crystals in a pavé setting- Leafael have got the sentimental aspect of jewelry perfectly cinched. And with Miss New York 2015, Nicole Kulovany, as the face of the brand, you just know they are good. They say love can take you higher. With this necklace, your love might just reach the heavens. A broken piece of a supernova sprinkled with a bit of cosmic dust- this necklace is an otherworldly beauty. The pendant is a galactic cut stone, an irregular chunk smoothened into a flat bezel, surrounded by three thin bands studded with little Swarovski crystals wrapped around it. For the stone pendant, there are just so many color options to pick from that you will undoubtedly find your favorite. 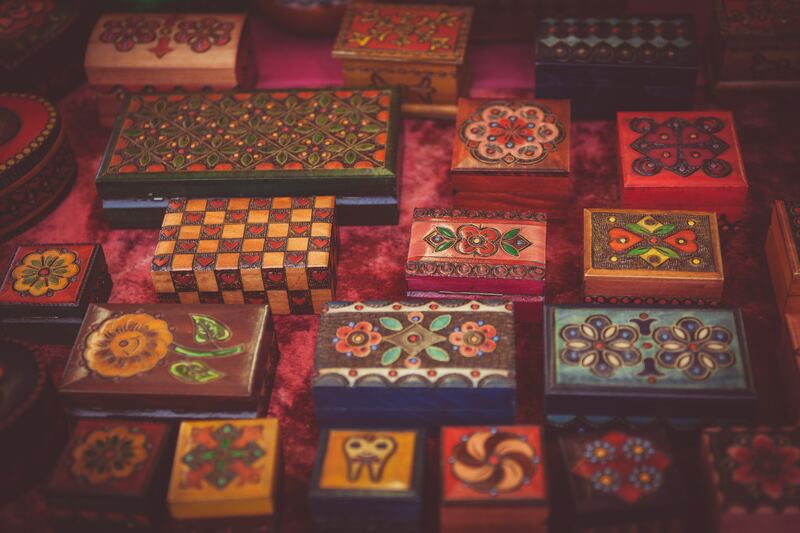 Blue, purple, white, black silver shade, yellow citrine, emerald green, light Rosaline pink, ruby red magma, sapphire blue, topaz brown and vintage rose pink- among this beautiful spectrum of colors, we don’t blame you if you find yourself torn between choices. 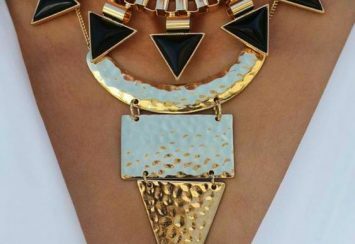 The necklace is made from a zinc alloy and is 18k rose gold plated. No allergenic metals such as nickel or lead are in it. There is a lobster claw clasp at the back while the length of the chain is 18 inches with a 2-inch extension. If you’d like to make your gift a tad more special, you can add the Wish Stone Stud Earrings and Bracelet, which are sold separately, to the cart. We can assure you, nothing would make her happier than a complete Swarovski set. A halo of Swarovski crystals guarding a glistening stone- words can’t do this exquisite necklace justice. For a love that can put celestial bodies to shame, there can be no better necklace than the Wish Stone Pendant Necklace. Expressing your feelings to your beloved is easier said than done. Dry mouth, racing pulse and a thudding heart-anyone who has attempted to lay bare their emotions is no stranger to these nuisances. But with a ring, the ultimate present for your loved one, it is so much easier. And if the ring is one of Swarovski’s greatest, so much the better. 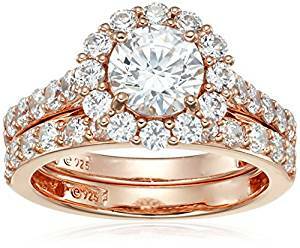 We are talking about the Flower Halo Ring from Amazon Collection. A romantic gesture which can put all others to shame, this gorgeous ring will do all the talking for you. It is understandable if you have a hard time wrapping your head around online shopping. A mishap never sounds too far away. And besides, when you are looking for gifts for your better half, anything less than the best will not do. But there is one nook on the internet which will never disappoint you, a constant among question marks. And it is the Amazon Collection. A curated selection of the best jewelry on the platform, handpicked by expert jewelers and gemologists, it does not get any better than this. This is a rock of a ring, big and sparkly. The band of the ring is divided into two, giving some dimension to the bed of Swarovski crystals. The two bands, filled in with little crystals, come together at the center of the ring to form the star element of this piece. A large Swarovski Zirconia, round cut and shimmering under the lights, holding onto the ring with prongs and surrounded by a sentinel of some more Swarovski crystals; every detail of this ring, large and small, steals the show. The Flower Halo Ring is available in 3 colors-platinum plated silver, rose gold plated silver and yellow gold plated silver. 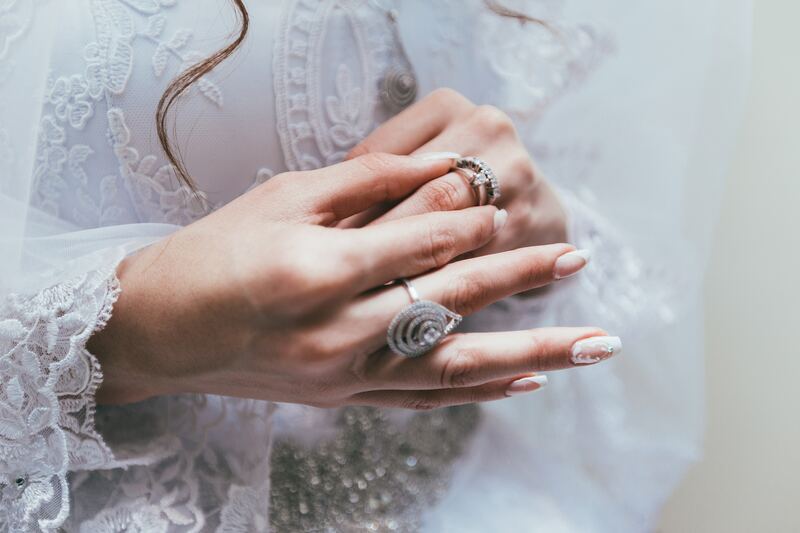 While the ring, in all its colors, is breathtakingly beautiful, the platinum plated silver, we find, is the perfect representation of a ring meant to unite hearts. It is also available in a number of sizes-5, 6, 7 and 8. The Flower Halo Ring is made from 925 sterling silver, a high-grade silver for safe jewelry. This is no ordinary ring, dainty and feminine. The Flower Halo Ring is an ostentatious show of crystals and class. An overpowering gale of crystals and sparkles, this ring does not leave any word unsaid. So, without further ado, put your fears aside and let the Flower Halo Ring take over. 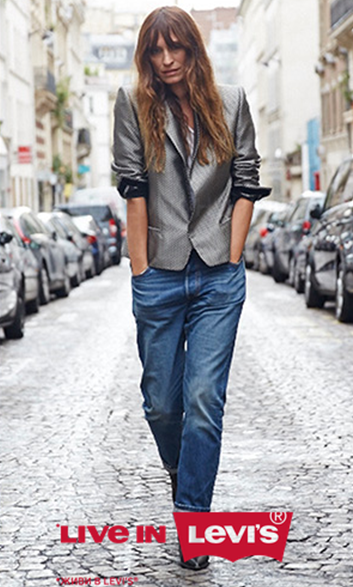 Is the woman in your life something of a fashionista? Does she have an eye for style and the latest trends? With the magical touch of Swarovski, the Swarovski Drop Dangle Earrings by Cate & Chloe are a sweet gesture indeed but at a second glance, you soon realize, it is undeniably stylish. At the style stake, Cate & Chloe is always ahead of the rest. The brand was born from the simple desire of the founders to help women find affordable jewelry that is trendy and also timeless. They believe not everyone should have to dig a hole in their pockets for jewelry that is true to their personal style. And while we are talking about affordable jewelry that is timelessly beautiful, Swarovski is not too far from the conversation. The unique design of the Swarovski Drop Dangle Earrings makes this a special pair. It is basically a simple long solitaire hook which extends out long, going in and out of the ear piercing, and dropping down to a Swarovski crystal, clasping it as the hook breaks into a prong. The Swarovski crystal on each earring is a round cut polished stone, a brilliant prism which captivates the eyes. The earrings themselves are made from 925 sterling silver. Small and dainty, the Swarovski Drop Dangle Earrings by Cate & Chloe are a breath of fresh air, a soft summer breeze which we are in love with. 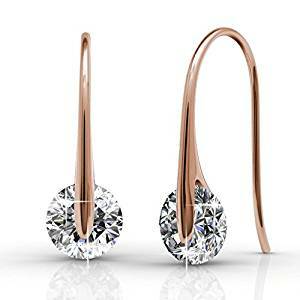 The earrings are available in two color options- rose gold plated or white gold plated. These earrings are perfect for an angelic glow, lit from within. After all, jewelry does not always have to be a glitzy affair. And Swarovski certainly knows the art of feminine style, how to subtly combine a quiet class to sparkling gems. To take the special lady out on a date night, start with gifting her a precious pair of these Swarovski Drop Dangle Earrings; this could be the beginning of the memories of a lifetime. As far as Swarovski crystals go, the ones in this pendant necklace take the cake. It is a feast for the eyes which seek sparkling delights. 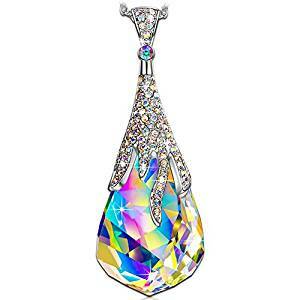 Large, colorful and beautifully opulent, the Magic Droplets Pendant Necklace brought to us by Kate Lynn Jewelry is indeed nothing short of being magical. Kate Lynn, although based in Malaysia, have found international glory with their excellent craftsmanship and exquisite designs; they have won hearts all over the world. Kate Lynn’s collections celebrate relationships, the everlasting bonds in our lives, beautified with the touch of jewelry. A family-owned brand, they extol sweet friendships, the strength of family and the intimacy between couples. Their wonderful jewelry collection certainly upholds the sentiment while capturing the latest trends with a crafted finesse. In fact, with new releases on a quarterly basis, Kate Lynn ensures that they churn out accessories which are always in tune with the moment and never outdated. A silver toned aesthetic with a personal design is a theme which has been a rousing success with the brand. Some Swarovski crystals sprinkled on top is the finishing touch that takes Kate Lynn’s creations to a whole another level. The Magic Droplets Pendant Necklace is a startling spectrum of colors, bright yet romantic. The pendant itself is impossible to miss; the unique cut paired with the colors will definitely grab anyone’s attention. At the very top, where it loops into the chain, the pendant trickles down and spreads into a sprawling claw shape which holds onto the finest Swarovski crystal we have laid eyes on. It is a thick water drop cut, pristine and sparkling in characteristic Swarovski fashion. It is an Aurore Boreale crystal, the very kind Swarovski developed with Christian Dior; it is a magnificent creation in the history of jewelry. And the glorious pendant does not end with just this. Throughout the grasping claw and upwards, the pendant is encrusted with numerous little Swarovski crystals, all of them Aurore Boreale. This necklace, we must say, is an iridescent explosion of Swarovski, an enchanting spell spun from our favorite crystals. This is not a dainty little necklace, meant to be tucked under a shirt. It is a bright mood among golds and silvers. The size of the pendant is about 1.97 inches x 0.59 inches while the chain is 17 inches with a 2 inches extension. The necklace is made from quality zinc alloy, safe for those with sensitive skin. For the crystal connoisseur, the Magic Droplets Pendant Necklace is a beautiful revelation, wrapped up in the colors of the sky. And as a gift for the precious person in your life, it is sure to rouse the emotions of love in all its shades, just like the crystals of this stunning piece of jewelry. Thought we had enough of our Aurore Boreale crystals, courtesy of Swarovski? Certainly not. 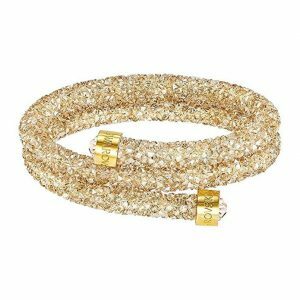 And this time, our favorite sparklers are in the form of a bracelet, delicate and beautiful. Although it is called A Little Romance Bracelet by Lady Colour, we think it has romance, written all over the bracelet, in abundance. Lady Colour does not take its work lightly. Over the years, this online jewelry retailer has created stunning accessories for the fashionable woman of today. Parisian designs with an affordable price tag is not a dream but just how it is at Lady Colour. Their product lineup consists of soft and trendy pieces in beautiful pink and blue hues, with lots of Swarovski crystals and an underlying feminine elegance. A Little Romance Bracelet lives up to the mark. This bracelet is Swarovski everything, completely beaded with these heavenly droplets. The bracelet is made from 925 sterling silver, a quality grade which does not irritate the skin and has a dangling lobster claw clasp. As far as bracelets are concerned, lobsters claw clasps are easy to open and close while remaining secure. For the design element, if you are a fan of Swarovski crystals and bright shimmers, you will instantly fall in love with this piece. The bracelet is strung with Aurore Boreale crystals, in a sequential pattern of sizes. For the larger crystals, you can even pick the cut from the options provided by Lady Colour: cubic or hexagonal. The cubic bracelet is a softer style, which blends in with the surrounding crystals in a seamless fashion while the hexagonal one pops out with its unconventional cut. The bracelet has an inner circumference of 7 inches and can be extended by 2 inches more with a chain next to the lobster claw clasp. If you see this piece as part of a complete set, that’s because it is. For more of this spectacular jewelry, you can buy the A Little Romance Necklace and Dangle Earrings separately and present to your loved one, a shimmering rainbow of Swarovski crystals. A little romance can make life so much more beautiful. So, why not indulge your partner with stylish jewelry which evokes love and devotion and of course, romance? With this gorgeous accessory on her wrist, she will definitely love you all the more for it. Love and a bad case of the butterflies go hand in hand. To remind you of the fluttering butterflies from the moment you met each other, a sparkling necklace with a butterfly figurine is all you need. Dainty in design and gorgeous with its crystals, the Butterfly Necklace by Sivery is a blissful coolness for lovelorn eyes. When it comes to jewelry with a hint of romantic love, Sivery is not new to the game. Pretty hues against sparkling Swarovski, in designs which speak to the heart- this online brand knows how to do it best. Sivery is especially adept in working little figurines in its creations: a crystal mermaid, glass butterflies, pristine hearts. Romantic motifs prevail throughout every single accessory of theirs and the Butterfly Necklace is a fine example of how Sivery does it. The necklace looks just as pretty as it sounds. The butterfly figurine, clasped to the chain, will turn heads and get compliments, everywhere it goes. The necklace is made from a rhodium plated alloy and so is the pendant. The rhodium adds a sleek and shiny appearance to the entire look, a gleaming silver surface made exquisite with sparkling crystals. The butterfly is crafted with finesse; light waves on the wings with the hind wings smaller than the ones at the front gives the shape a delicate silhouette. Within the butterfly wings, 4 sapphire blue crystals are set into them, an inner outline for the butterfly. Within those blue Swarovski, white Swarovski crystals are studded inside, again in the shape of the wings. 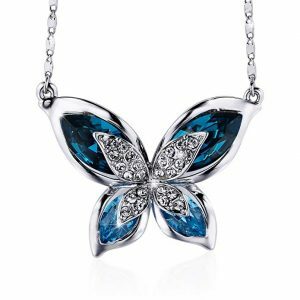 This trifecta of Swarovski-alloy, blue and white- creates the perfect butterfly jewelry, a symbol of feminine beauty. With a length of 1.34 inches and a height of 0.35 inches, the butterfly pendants shines big and bright. The length of the box linked chain is 16 inches and can be extended by 2 inches, the perfect length for a classic necklace. The customer service of Sivery is also very commendable. If your Butterfly Necklace is not exactly what you wanted, their full money back policy can be of use to you. Besides, Sivery is always at the beck and call of their customers, answering any concerns. A butterfly represents hope, love and life. For a relationship that is flourishing, it is the perfect emblem, signifying how far you have come together and the beautiful love that has blossomed between the two of you. Swarovski crystals, sprinkled over the wings, make sure that the journey you have embarked on together is truly a magical one. Bracelets studded with clear Swarovski crystals make for some classy jewelry, the kind you wear to a black tie event. Effortlessly elegant, they complement high fashion looks for a style that money can’t buy. The Love Encounter Bangle Bracelet by Menton Ezil is one of those accessories which might be just for the wrist but can transform an entire look from girl next door to a red carpet diva. Menton Ezil-sounds chic, doesn’t it? Their collection lives up to their name. 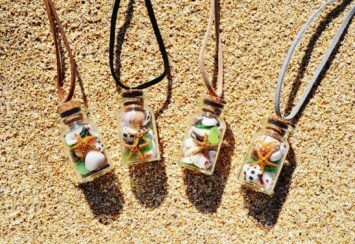 This online brand creates necklaces, bracelets and sunglasses in sophisticated, toned down designs with a retro-chic element to them. For those who like to keep their accessories clean and simple, you need to check out Menton Ezil. The best part is the expensive veneer that their products flaunt while being such affordable options for the everyday woman. Ezil offers plenty of variety for you to choose from. For instance, when it comes to rows of crystals beside the open band, you may pick clear, aqua blue or a deep pink color for the Swarovski crystals. This bracelet completes with a neat fold over clasp. Although the clasp may look intimidating, it is very easy to use. To open the clasp, hold the flap at the sides and pull it open. Closing it is just as simple. The length is around 6.7 inches to 7 inches; it can be adjusted by the additional link at the back which you can remove yourself. 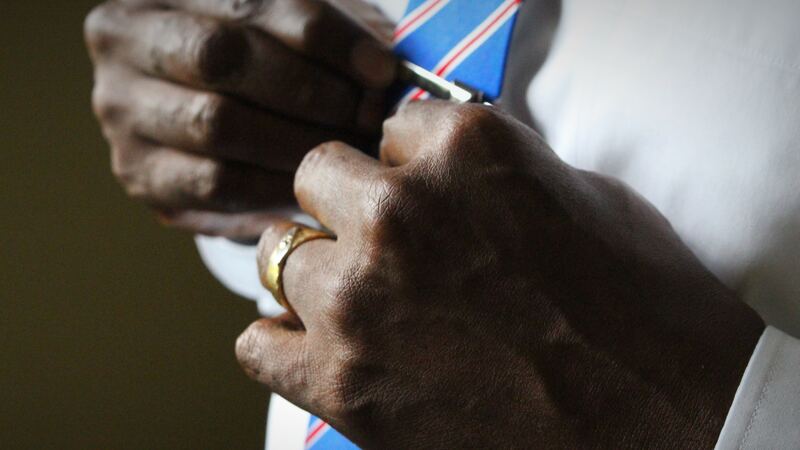 Simplicity, especially in bracelets, is the mark of an extremely refined taste. 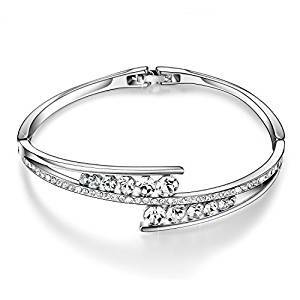 The Love Encounter Bangle Bracelet is a posh piece, meant for occasions when you don’t just dazzle but do so effortlessly. If you are going to be presenting your lady love with a gift, you best make sure that it oozes style which never dies; with this bracelet, you know she is going to look like a classic beauty, an Audrey Hepburn among everyone else. You did not possibly think we would conclude our list without mentioning a beautiful Swarovski piece, crafted by the legendary brand themselves, did you? Saving the best for the last, the Crystal Dust Double Bangle Bracelet by Swarovski is a gorgeous style accessory, the star of your look. There is no need to introduce Swarovski. When it comes to crystals and fashion, this brand has reached iconic heights. With technology guiding them every step of the way and class being an indispensable part of everything that they do, Swarovski is an international sensation that cannot be stopped. Lovers of Swarovski, this is about to be your latest obsession. Completed encrusted in chunky Swarovski crystals with not an inch left to be seen, this wrist accessory could well be on its way to the hall of fame of jewelry. It is a spiraling bracelet, which goes on to form three loops while ends are capped with gold or silver plated metal, with Swarovski engraved on it. The crystals are laid all over the bracelet, in an irregular pattern giving the appearance of reflective glass shards while the jagged texture alludes to undertones of edgy, wrapped in a crystalline beauty. 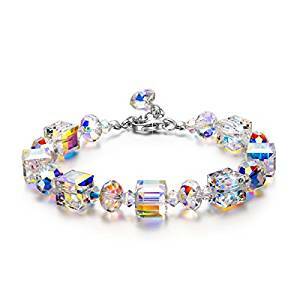 If you find yourself wondering what this spectacular bracelet would look like in different colors, Swarovski has got you covered. Pink, black, blue, gold, grey and white- there is a plenitude of crystals for you to pick from. There are also two different sizes available- the larger bracelets have a diameter of 2 1/8 inches while the smaller ones are of 1 7/8 inches. Lavishly endowed with Swarovski crystals, this is sparkling jewelry at its peak; it can melt the coldest of hearts. It is a bit on the steeper side but the brand, quality and the sheer amount of sparkles are what you are paying for. After all, this is a name that has been associated with royalty. And besides, who can ever put a price tag on love?